Maurice Mazière, who was appointed Director of CEA-Cadarache last July, and ITER Director-General Motojima, who arrived at ITER at about the same time. Here they participate in the ''Cérémonie des vœux'' on Tuesday 11 January. Wishing each other happiness, prosperity and good health on the occasion of the New Year is a tradition in most countries and cultures. In France, it is more than a tradition ... it is a national ritual. From the President of the Republic down to the Mayor of the every village, and from the largest institutions to the smallest companies everyone organizes a Cérémonie des vœux (Best Wishes Event) during the first weeks of January. Such a ritual was observed on Tuesday 11 January in Cadarache as CEA and ITER jointly presented their vœux to each other and to the local officials and personalities gathered at La Fenière. For both institutions, 2010 was a momentous year. On CEA's side, major milestones were reached in the construction of the RJH experimental reactor, the RES (submarine propulsion) and in several installations under renovation. At ITER, on the other side of the fence, the approval of the Baseline, the spectacular progress of construction on the platform and the implementation of a new organizational structure opened a new chapter in the history of the project. 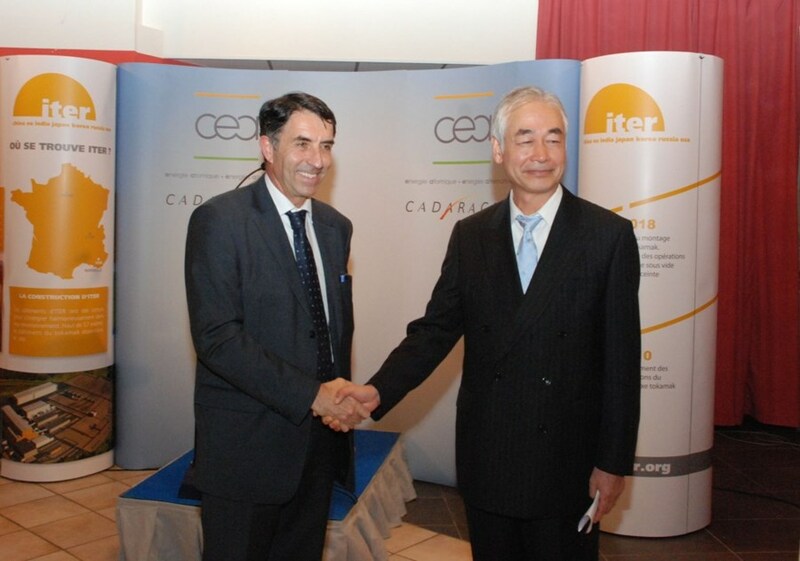 Maurice Mazière, who was appointed Director of CEA-Cadarache last July, at about the same time Director-General Motojima arrived at ITER, stressed the importance of the "synergies" established between the CEA, Agence Iter France and ITER teams. Addressing CEA management, the local authorities and elected officials, the Director-General expressed his appreciation for "the warm welcome and constant support" that was provided to the ITER staff and their families. "Their well-being and quality of life," he said, "are essential to the success of our project." As for 2011, it will indeed be another year of challenges. The ITER Director-General has no doubt, however, in the capacity of the staff to overcome them "on the condition," he said, "that we believe in ourselves and in our project and also work as hard as we can to reach our objectives." A video of the joint CEA-ITER "best wishes" event is available on the TV7-Provence website.